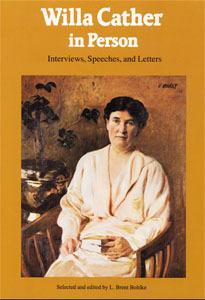 1921: Hastings and Omaha: Willa Cather Raps Language Law . . .; State Laws . . .; Nebraska Scored . . .; "Don't Imitate" . . .
1925: Chicago: "Machine-Made" Novel . . .; Art Now Only Rule . . .